The exhibition is dedicated towards the women empowerment and aimed at honouring the female and child victims of abuse and murder through the sculptures that represent pride, exultant gladness and high spirits and promoting the message that it is time that every individual of the country has to stand together for justice for the victims and their families. 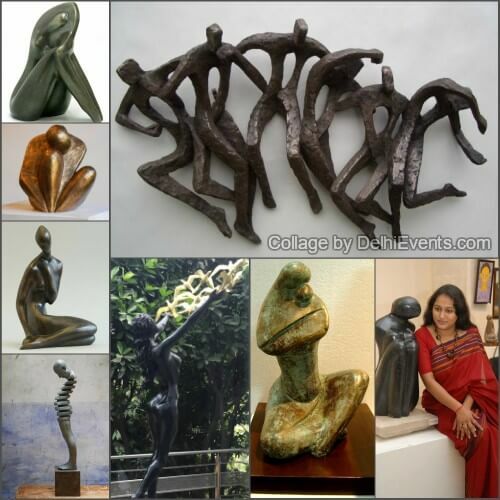 Adittee Garg, the sculptor, the artist, the person and the humane soul in her has discovered it well. Her vision sees through the hard rocks and stones to bring out the essence of Life. As her gentle hands chisel out the bits of rocks, her hidden emotions slowly take form, that though silent, speak from their souls. The sculptures thus formed reveal positive emotions of optimism, love, submission and awe. Life is a race these days where each one of us are running against time and travelling a journey which has no destination. A moment’s stop at Adittee’s work often tugs at one’s heart and rewinds us back to those fine feelings that we have long ignored. Those moments of serenity, joy, ecstasy, admiration, trust and acceptance are so vivid in her work that the mind and soul receive the warmth and calmness that we seek. Her soulful presentations are worth a place in our day to day lives to shower in the appreciation of Life and be grateful to the Almighty that we still exist. From a small coffee table sized rock cut emotions to larger than life sculptures , each one has a unique language that they speak. Yes, Adittee’s handcut rocks and moulded Bronzes speak volumes that one can hear as you take a glance over each curve of the rocks or touch & feel the grains of the stones. Gloss or matt, smooth or granular, they ensure that you get all that you seek when you own one all for yourself. Such is the attraction, such is the aura that your hand reaches out to feel the emotions that each sculpture depicts. There lies the success of this sculptor. These are completely mesmerizing.Every sculpture is very fine piece of art.if you are looking to buy bronze elephant,then you can get it from bronze-sculpture.